What I am obsessed about though are my face blemishes. While my skin heals easily, it also becomes damaged easily. I get a blemish whether I pop a pimple or not so I look like I have freckles when I'm not wearing concealer. If we are to be technical about it, I guess we can say that my face is full of small scars. Ugh. My only solace is that the blemishes fade in a month, so I just buckle down and wait them out. When Hiruscar sent me a tube a couple of weeks back, I practically forgot about it. 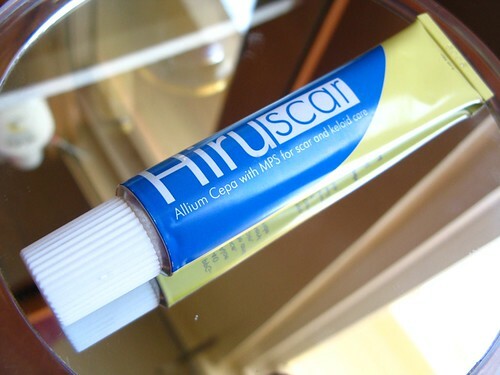 But I had a crazy idea the other day - can Hiruscar remove blemishes? I just had to know. So for the past two nights, I've been applying this clear gel on my spots. I didn't experience any negative reactions so I will be continuing this regimen. The tube says I should use it at least two times a day, but I am not comfortable in using it every morning. The insane sunlight and the potent medicine may not jive well on my skin. I'll update you if I see any improvement. In the meantime, I would love to know how your experience with Hiruscar was. Did it work? Was it a bust? I've been looking for reviews on the net, but they're few. Would really appreciate your feedback.